I checked your jotform http://www.jotformpro.com/form/50744548765971 and I think the problem is with the condition logic used to show the Custom Thank You Message of the form. the conditions are conflicting with each other. Both of the condition can be true at any given time, so it is preventing the action to show the custom Thank You Message to trigger. I suggest you test it first by removing any of the 2 condition. Try testing it first using only 1 condition for the custom Thank You Message. I also made a test form version http://form.jotformpro.com/form/52216189527964? You can test submit my test form and check which custom Thank You Message comes out. 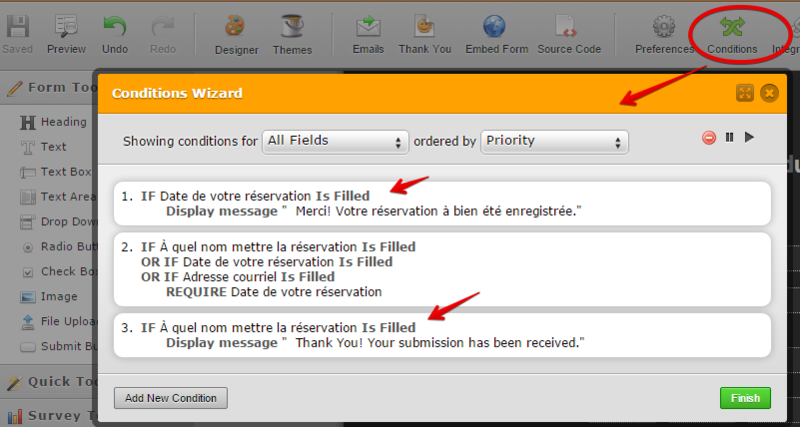 In my test form, I removed the condtion "A quel nom mettre la..."